As we have described in earlier blog articles, diagnostic screening by flow-injection tandem quadrupole mass spectrometry (FIA-MS/MS) has foundational relevance in application areas such as newborn screening and plays a critical role in the healthcare of millions of patients every year. Over the last 20 years, Waters has provided analytical capabilities to clinical scientists worldwide. 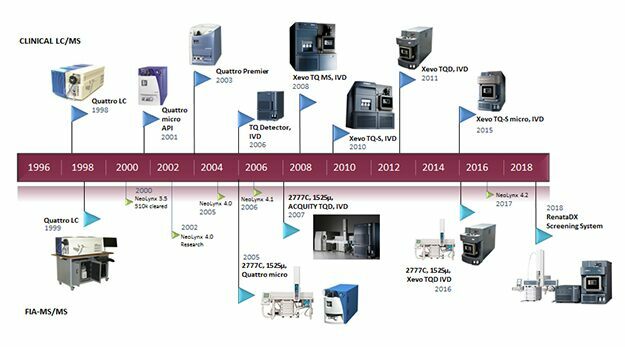 The triple quadrupole mass spectrometers for clinical use have continually evolved, from the early research use of the Quattro LC to the in vitro diagnostic (IVD) capabilities of the ACQUITY TQ Detector to the Xevo TQ-S micro Mass Spectrometer. This “extended evolution” since the late 1990s – partly our inspiration for the “Xevo” name itself – has been matched by purposeful innovation in systems deployment for FIA-MS/MS diagnostic screening applications. Waters’ heritage in clinical mass spectrometry is underpinned by a deep understanding of the needs of customers in FIA-MS/MS diagnostic screening. Through brands like Quattro, Xevo, MassLynx, and NeoLynx, Waters’ technology helped establish the standard of measurement for FIA-MS/MS. Furthermore, Waters has provided confidence to clinical scientists so that they can rely on the analytical system to deliver the results that impacted the treatment of thousands of patients – usually in the critical first few days of life. Today, Waters’ legacy of purposeful innovation continues with the recently introduced RenataDX™ Screening System, a flow-injection tandem mass spectrometry system for high-throughput analysis of extracted dried blood spots and other physiological matrices. Designed expressly for clinical diagnostic use, the RenataDX Screening System evolves all aspects of prior FIA-MS/MS systems. 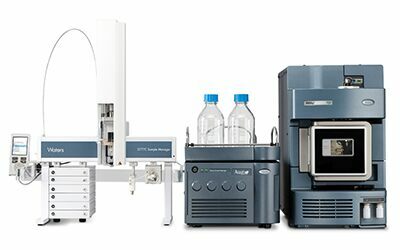 NeoLynx Application Manager becomes our next-generation IonLynx Application Manager; mass spectrometry now includes the Xevo TQD IVD; the 2777C advances to the 3777C IVD Sample Manager; and solvent management now benefits from the precision of the ACQUITY UPLC I-Class IVD. Most importantly, the RenataDX Screening System provides continued trust in diagnostic screening, allowing clinical scientists to maintain their focus on their patients, rather than on the tools in their laboratory. The new Waters RenataDX Screening System delivers fast, accurate results for clinical scientists.